First, I should start with a little background. As a child I was extremely withdrawn. I rarely spoke to anyone – especially not unfamiliar people. Visiting the homes of family or friends I would sometimes disappear behind the couch or some other large piece of furniture and not come out until my mother announced that it was time to leave. In school I was frequently paralyzed with fear when called on in class – unable to do anything except stare blankly at the teacher. My father was in the military and when I was 7 years old our family moved to Germany. Not knowing the language seemed to make my silence a much more acceptable behaviour. We lived in a small town about 20 miles from the air force base. Our family was befriended by a German family who showed us all the local attractions and taught us about their culture. As Christmas approached there were many ‘new’ traditions for us to experience. The decorations are what I remember the most. 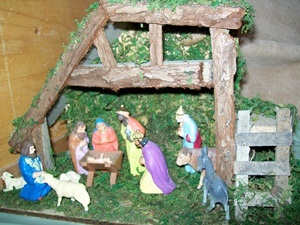 One day when we went to visit our German friends there was a Nativity scene set up on a table in their living room. I was immediately drawn to it and spent the remainder of the visit sitting on the floor by the table. I examined it from every angle mesmerized by the intricate details. As I gently touched the figurines I remember thinking of all the painstaking work that must have gone into carving each piece. I’m not really sure if I was ever told that it had been hand made but that was what I envisioned. I never picked up any one of the pieces – I couldn’t imagine disturbing any part of it. Everything was so perfectly arranged I was certain that moving a piece would disrupt the entire scene. Each time we visited our friends’ home I went to the table and stayed there until it was time to leave. Traditionally our family opened gifts on Christmas morning but our friends’ gift exchange was held on Christmas Eve. They invited us to attend their evening celebration which began with an outdoor event — some sort of parade or march through the streets of town. Those details are unclear, it was so long ago. Afterwards, we returned to their home for the remainder of the evening. As we gathered in their living room I took my customary place by the Nativity scene, but something was different. Beside the familiar display there was another table. On it there was a second Nativity scene – smaller and simpler but still stunning. As I sat there comparing the two I was vaguely aware that someone was speaking. I looked up to see our host standing in the doorway. He smiled at me and said something but I couldn’t understand the foreign words. I looked at my mother for translation and she said “He’s telling you that that smaller one is yours to keep”. I still have those figurines. The original stable I’ve had to replace, it did not survive so many years of moving and storage. Each Christmas I set it up and remember the day I received it so long ago. A small gift given to a child who tried so hard not to be noticed – but was. I wish you all a Merry Christmas and hope your holiday season holds wonderful memories too. There’s just one more week until Christmas. It’s not my favourite holiday – I find the overindulgence to be off putting. Yes, there are some traditions that I enjoy but I’m more of a ‘if you want to’ as opposed to ‘you must do this’ type of person. Traditions – the handing down of statements, beliefs, legends, customs, information, etc., from generation to generation, especially by word of mouth or by practice – are often viewed as requirements. When it becomes compulsory to participate the enjoyment is sometimes lost. Personally I love Christmas music and I would enjoy listening to it all year round but I don’t (when other people are around) because I respect that not everyone wants to. I also enjoy some aspects of Christmas decorations but I prefer ‘simple’ over ‘extravagant’. 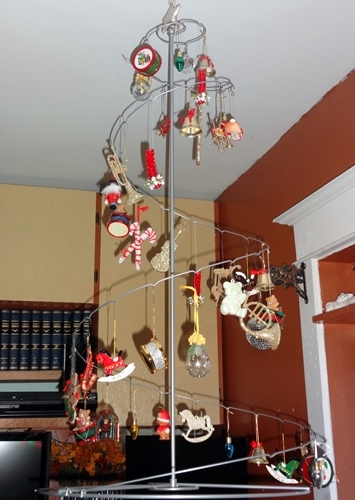 Every year my step-grandmother used to make Christmas tree ornaments for each of her grandchildren and great-grandchildren. I have many more ornaments than I could ever use on any tree even if I did put one up especially for the Christmas season. 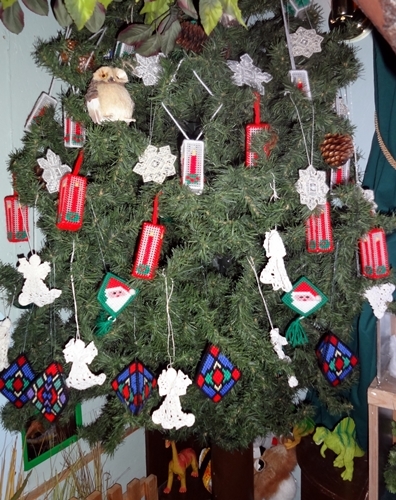 I do use some of these ornaments to decorate the tree in the nature area. My mother briefly continued this tradition with my own children but many of these ornaments were very fragile and didn’t often get displayed. Last week I found this unconventional tree at Ikea and thought it was perfect for these ornaments. Yes, I continued to defy tradition and hung this ‘tree’ from the ceiling – because I have toddlers, cats, and no extra floor/table space. This year I am including a Christmas decoration in the gift bags that I will give to the children. I plan on doing this every year from now on. This year I purchased the ornaments but in the future I hope to make some. 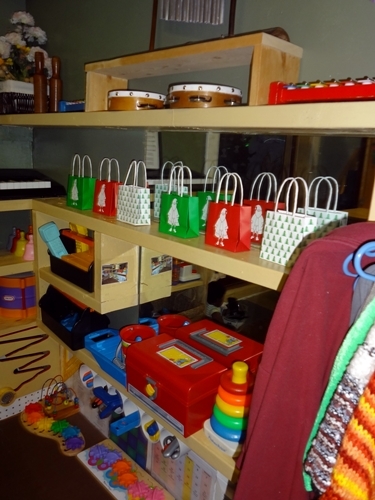 I also wanted to have some type of free play Christmas activity available for the children so I placed these little gift bags on the shelf. I gave no directions, I just waited and watched. 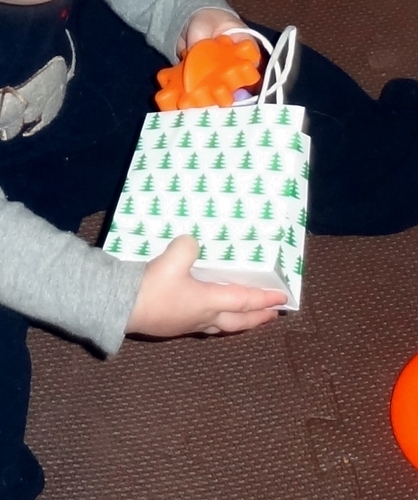 Of course the infants’ favourite thing to do is fill the bags with various items – they’ll do this with any container. The older children immediately chose to ‘go shopping’. There were some sorting games where they tried to place specific coloured items in the bags. 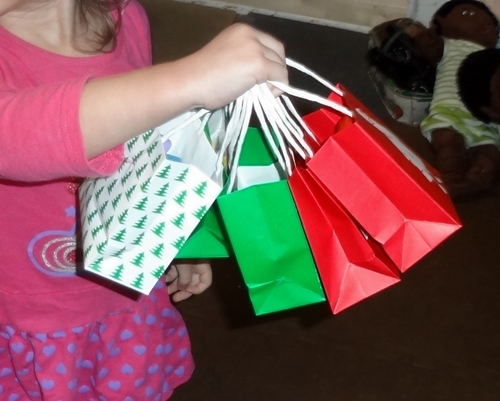 They also used the bags for ‘hide & seek’ and guessing games. 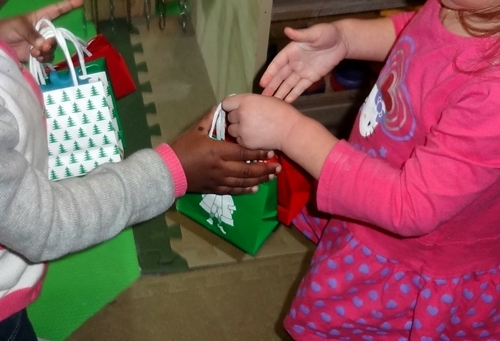 It took a couple days but eventually they began to exchange ‘gifts’. I love it when giving is a choice not a obligation. When I signed on for the Post-a-Week 2011 challenge I also began following their daily posts for topic ideas and inspiration. Many of their suggestions for post topics have been very interesting – some I thought would be fun to answer. Others like the one from October 2nd ‘If You Could Change How Schools Work….’ I would have loved to answer but they would have taken a huge amount of time and probably a whole series of posts. Generally though, I have enough ideas for post topics that I don’t need any more suggestions. The suggestion from December 11th was one that I couldn’t ignore. They asked ‘What’s the best gift you’ve ever received?’ I immediately knew my answer to this question. There was no deliberation, reflection, or consideration. For me the answer was instantaneous. I didn’t have time to write that day but I couldn’t stop thinking about it. I was out shopping for most of the day. I noticed the items in other carts. Were these things gifts for others? Would the recipient think it was the best gift they had ever received? If so, for how long would the item remain at the top of their list? I suppose the answer would depend on the recipient’s definition of ‘best’. Whether the gift was something they desperately needed, had the hottest new technology, or something they considered to be special in some other way. For me the gift that came to mind was not the ‘biggest’ gift or the ‘most expensive’. The item itself was not particularly rare or unique. I did not receive this gift from someone who was a prominent part of my life. However, this gift is the one that I consider the most memorable and it has remained so for more than 40 years. As Christmas approached there were many ‘new’ traditions for us to experience. The decorations are what I remember the most. One day when we went to visit our German friends there was a Nativity scene set up on a table in their living room. I was immediately drawn to it and spent the remainder of the visit sitting on the floor by the table. I examined it from every angle mesmerised by the intricate details.